Anti-homosexuality activists march through the streets of the Ugandan capital, Kampala, on March 31, 2014, in support of the government’s stance against homosexuality. In February, when Ugandan President Yoweri Museveni signed an anti-gay bill that imposed harsh prison terms for acts of homosexuality, most Americans were probably clueless about the bill’s ties to U.S. conservative Christians. In the documentary God Loves Uganda—which airs Monday on PBS—Academy Award-winning director Roger Ross Williams shines a light on the U.S. evangelical movement in Africa and how its homophobic rhetoric is fueling a backlash against gays, sometimes with deadly consequences. In the film, Williams follows young missionaries from the International House of Prayer, or IHOP, the Kansas City, Mo.-based church founded by Mike Bickle, who once famously said that Oprah Winfrey was the “forerunner” to the anti-Christ. We’re introduced to several of IHOP’s senior leaders, including Lou Engle, who is well-known for holding anti-gay rallies in the U.S. and Africa. “He [Kato] told me this is a story that hasn’t been told and he kind of anointed me to go off and make the film,” Williams said. Officials claim Kato’s death was the result of a robbery, but his supporters believe he was targeted. His funeral, and the anti-gay protesters who show up to disrupt the service, are featured in the film. Williams, who won an Oscar for his 2010 documentary short Music by Prudence, making him the first African American to win for directing and producing a film, took a moment to talk to The Root about the lasting impact American evangelicals may have on Uganda and Africa. The Root: How were you able to convince IHOP to give you so much access for the documentary? Roger Ross Williams: When I approached IHOP, I said I wanted to talk about the anti-homosexual bill, the influence of American evangelicals and they immediately said, ‘You’re part of the gay agenda; why should we do this?’ I said, I’m not part of the gay agenda. I may be gay, but I’m a filmmaker and I’m going to let you speak for yourself and if you believe what you believe in, if you believe this is biblical truth, then you need to stand up for your beliefs. And they totally agreed with that. TR: Why is Uganda so important to evangelical groups like IHOP? RRW: Because Uganda was the perfect storm, because Uganda had [one of] the highest HIV/AIDS rates in Africa [in the early ’80s], because Uganda was devastated by [then-President Idi] Amin and civil war and it was a vulnerable population. The Pentecostal movement was underground because Idi Amin outlawed it. When Amin fell [in 1979], and Bickle and these guys were there, [the Ugandans] welcomed them because they brought in money and resources. [The evangelicals] have invested incredible resources in that country and they realized they could create their nirvana; they could create their perfect Christian nation. 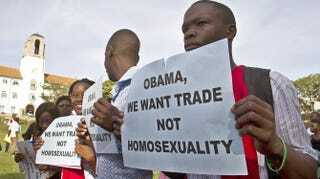 TR: It seems as though this bill has helped fuel an escalation in anti-gay violence in Uganda. Is there something cultural in play? RRW: There’s two reasons: One is that what Scott Lively and what the Americans said is, that homosexuals are there to recruit children and, as Scott Lively says in the film, their ultimate goal is to wipe out society. Culturally, when someone comes in and threatens your tribe and your family, you kill them, you go to war, and that’s what they see this as—this force from the West is coming in to destroy their families and destroy their society. The other thing is it’s political. Ugandans are frustrated. They have a corrupt government and they use it as a way to take out their frustrations. It's scapegoating. It’s what happens in any genocide—people dehumanize and demonize a certain group and they take out all their frustration on that group of people. And that’s what's we’re seeing happening in Uganda right now. TR: What effect will the law have on HIV/AIDS in Uganda? RRW: Devastating. The Ugandan government has already raided a clinic that provided [services to AIDS patients]. It’s devastating because what the law says is that you can’t serve that community. It’s going to be devastating. TR: Like IHOP, there will be those who say because you’re a gay man, you do have an agenda. What do you say to that? RRW: I don’t put words in anyone’s mouth. In the film I’m just a fly on the wall. It’s up to the viewer to decide what they think or what they feel about what anyone is doing. I don’t have any judgment myself and that’s important to me as a filmmaker. I wanted to show kids who innocently think they’re going to spread what they believe is biblical truth, but how that gets interpreted in Africa. And because of what they represent in America—they’re white and blond, they’re from middle America, they represent wealth and power and money and fame—that those kids hold weight and power even over an elderly woman in a hut. These kids don’t understand the culture they’re going into; they don’t seem to care—it’s like an adventure. But it’s causing lasting damage. God Loves Uganda premieres Monday on the PBS series Independent Lens. Check local listings for times.